It was the soundtrack to many a half time, during Peter Taylor’s reign as manager. And Peter Jackson’s. And the early part of Phil Parkinson’s. Bradford City would inevitably be struggling to impress, and the inquest on the concourse would see his name frequently aired as the problem. James Hanson isn’t good enough. James Hanson is holding back the club. James Hanson should bloody well go back to working in the Co-op. Such dark days and such monotonous mutterings seem a world away now as the Bradford City feel good factor remains high and our adaption to the higher surroundings of League One looks promising. We have come a long way, player-wise, since the infamous “Love the club, hate the team” chant aired during a 4-0 thrashing at Southend in April 2011. It has been some time since anyone wearing claret and amber was booed whenever they touched the ball. Proud of this team, proud of this club. And throughout the progress made from the difficult era of Taylor/Jackson/Parkinson’s early days, there have been few on-the-field constants. James Hanson, Jon McLaughlin, Luke Oliver and Nahki Wells: the only players still with us who were already in the building before Phil Parkinson. James Hanson, Jon McLaughlin and Luke Oliver: the only players still with us from the Peter Taylor era. 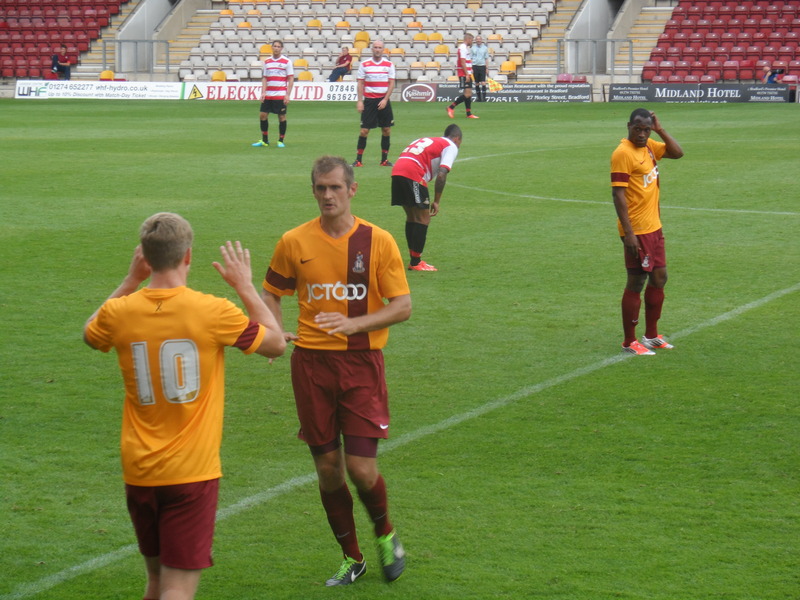 James Hanson and Jon McLaughlin: the only players still with us from the Stuart McCall days. James Hanson. The guy who was supposed to be the weak link when Taylor was struggling to impress. The guy who Jackson made a song and dance of telling the press how he’d called the striker’s parents in to discuss his focus. The guy who only scored two goals in his first 16 appearances under Parkinson. The guy who is still leading our line, rather impressively too. It has been a remarkable display of character, determination and endurance. Unloved and unwanted by a section of supporters, ups and downs with his two previous managers, Hanson has blossomed with the club to become a key player. No longer can anyone reasonably argue that he is the problem. If, indeed, he ever was. Yet here he still is, impressively leading the line. His list of personal achievements has grown considerably. In the happy times that were last season, Hanson was every bit as prominent as anyone else. Still, he may not net as regularly as we’d like – but in terms of significance, many of his goals last season were priceless. His place in Bradford City folklore is assured. Watching Hanson continue to impress in the higher division of League One, the memories of the criticism and abuse he received from many supporters when the team was in a mess two years ago offer perspective for how far he has come. Nahki Wells might be getting all the headlines and attention, but the Bermudian would surely be the first to admit just how vital his strike partner is to his success. And though Wells is destined to move up to the Championship at least, with or without City, there’s a growing feeling that Hanson too is becoming an asset that the club will do well to keep hold of. Maintain his current form – and that is an ‘if’, still, with Hanson – and he too could play at a higher level. Put him up for sale now and he clearly wouldn’t command the size of transfer fee that Wells could ultimately go for, but he would nevertheless find a long list of suitors. Hanson is not just a hard-worker who has scrapped his way from the bottom of the pile, he is a talented footballer who even now doesn’t get as much as credit as he deserves. It would be wrong, however, to look back on the past with smugness and criticise those who were so unfairly critical. The James Hanson who struggled for fitness and form under Taylor – worryingly looking directionless during his second season at Valley Parade – is not the same player as the one today. There have been lessons taken from the bruises picked up along the way. Hanson has developed immensely since those days. He had to. Otherwise, like Michael Flynn, Luke O’Brien and Steve Williams – other players from the McCall era still around for Parkinson’s early days – he would no longer be here. The team has improved considerably over the last two years, and Hanson has had to improve to keep pace with that. For someone who, in the past, was accused of being weak mentally, to display such resolve and strength of mind to prove people wrong is hugely commendable. Let us not forget that Parkinson went to great lengths trying to sign players to replace or at least compete with Hanson. Craig Fagan was initially brought in to ease the burden. Paul Benson was sought after, before a failed medical put pay to his move from Charlton. Even last January, James Vardy was at Valley Parade for talks. Leicester pushed up the asking price at the last minute, so Parkinson looked elsewhere: Andy Gray. There can be little disputing that the signing of Gray has not worked out, but it has indirectly been a good thing. Hanson was struggling for form at the time of Gray’s arrival, with just two goals in 27 games. A New Year’s Day miss at Morecambe resulted in heavy criticism. A tight game, with City well below their best – teams challenging for promotion have to make the most of the limited opportunities occurring in such contests, if they want to be celebrating come May. Hanson’s pitiful attempt on goal that day could have finally proven the end of the line. The words “we need a striker” coming not just from the lips of supporters filing out of the Globe Arena, but possibly also from the manager. The post-Gray arrival form of Hanson would attest to raised standards – eight Hanson goals in the 23 games which followed Gray’s arrival (one in three). A semi final aggregate winner over Villa. The goal that sealed City’s place in the play offs. A strike at Burton that helped the Bantams get back to Wembley. The opening goal in the play off final. Hanson’s ongoing relevance to City is the result of his own highly impressive attitude, and also the coaching and belief of his manager. Whereas his progress seemed to stutter under Taylor and few favours were provided by Jackson – who infamously pandered to the crowd by substituting him during his final match in charge – Parkinson has helped him to build on his positives and improve his weaknesses. The biggest thing Parkinson has seemingly given to Hanson is mental strength. It’s easy for a targetman to look bad and they will often be incorrectly criticised for doing the right thing, causing them to regress in fear. Under Parkinson, Hanson has learned not to be afraid to make mistakes and to be brave in his play. For sure, there are still times now where he will flick the ball on to no one or fail to control a long ball, thereby looking poor. But he seems unperturbed by any groans such moments attract, and is single-mindedly focused on doing what’s best for the team. His strength in the air is obvious but has shown improvement. He will win just about everything, but now displays a much better second touch. Once considered a bit too nice on the field, Hanson has developed a knack of bullying defenders that is unrelenting. Often unfairly pulled up for fouls, in recent months there has been a greater subtly to his hold up play that has given the referee less reason to blow up. Hanson has always been better with his feet than his reputation suggested, but the wonderful goals at Burton in the play off semi final and against Carlisle last week have underlined this even further. One shrewd move by Taylor was to award Hanson a four-year contract at the end of his successful debut season. That contract comes to an end next May, making this a significant year for Hanson. It is surely a given that City will want to keep him and, just like with Wells, it is probably something that needs to be addressed well before the end of the season. Tying him down on another deal protects the years of investment made in developing Hanson from a raw non-league striker to the player he is today. If and when he does leave the club, you’d like to think a significant profit would be made on the original £7,500 transfer fee. For Hanson, this season is about confirming just how good he really is. A goal return of between 10-15 would be good, considering this is a higher level. There has often been a feeling he could net more in a season than he has to date (15 in 59 appearances last season was his career best), and certainly this would be as good a year as any to demonstrate that. Anything above 15 goals would be a huge achievement. I firmly believe that Hanson has the potential to be a good Championship striker, providing he continues the path he has been on during these past two years in particular. Previous form suggests he will continue to be prone to spells below his absolute best where the goals will dry up, and there’s no doubt that he still needs to score more often in away games. But given how far he has come over such a relatively short period of time – and his still young age of 25 – I’d back him to overcome these issues and continue to add even more to his game. Hanson was once upon a time very lucky to be given an opportunity at this football club after it seemed a professional career was beyond him. But over the past four years, he has consistently and increasingly demonstrated that Bradford City are very lucky to have him. I agree completely with your analysis, Jason. I think we should be trying to tie his contract up for longer. Wells wouldn’t be nearly so impressive without Hanson. They need each other. We just don’t play as well without James. Lol everyone knows hanson is my favourite player at cty but few really know why I rate him so highly. My farther was my best friend in my life he used to take me to watch football at all levels be it the local pub team, to Burnley, Guiseley, and of course bradford. We had heard of james hanson from a few friends who seen him at eccleshill before he’d arrived at Guiseley. This lad is difficult for defenders to play against they were saying over a pint. We got to watch him play regular at Guiseley it was obvious he was a class above at that level scoring goals at will. My farther always said he make a pro and wasnt long before bradford had looked at him and a deal was struck!. James always gives 100% in his debut season at cty he took his chance well 13goals and player of year in the bag!. For me James had been shoved into the team as the focal point of our attacks with his height and skill in the air lets not forget your second season is always harder as teams now know what to expect? I can only think of one experienced player that James could have learnt from, that was peter thorne but he had left then he was left with certain strike partners that weren’t good enough in my opinion leaving James in a team that knew if they wanted shut of the ball the big boot upto hanson was always on! Lets make James look like a donkey let the supporters have a go at him. Its great to see him work the channels, bring players into play, the physical battle he gives defenders, not many target men do score as many goals as james hanson does tbh only at prem level maybe. Last year hes started adding more and more to his game improving all the time. The supporters now sing his song and I laugh coz its nothing more than he deserves! It was never james that was the poor player but the players around him. He’s now looking at another contract but I sincerely hope the club get him signed up asap . Could I still goto valley parade without Mr dependable leading the bradford line ? Yes but where ever he ended up playing I’d still go watch him when cty away. Thanks jason,james appreciates yours and everyone else’s support.And i might add gives 100% to bradford city everytime he pulls the shirt on. Indeed he does put 100% every time he plays. It’s a privilege to watch him play for us. Let’s hope he’s fit for Saturday. I saw James at Guiseley and thought he was a real prospect. Unfortunately sometimes supporters only appreciate players when they are not playing and City are just a different side when he’s been injured or out of the team. If there are any critics still out there I would urge them to just watch him for 90 mins. Don’t watch the game, just watch his work off the ball. His strength, work rate and commitment are astonishing especially given the treatment he receives from some defenders who are well aware of the threat he poses. The guy has to practically play football whilst giving his opposite number a piggy back! I think the biggest endorsement of James has to be that 4 managers now have consistently picked him to lead the line. Given the player churn at Bradford over the years that is remarkable. I think had it not been for the fact that we have had a series of wide players who struggle to deliver a decent final ball with any regularity James’ goal tally would have been far greater. As good as Nahki is I honestly think that James is more central to City and would be harder to replace. A very good article Jason, and long overdue. I took a good friend with me to the Capital One cup matches last season who is a Wednesday fan, he was aghast at some of the comments aimed at Hanson from a few home supporters around us. This was when we were playing Premier League opposition, and if truth be told in a game where a Division 2 centre forward had no right to win anything, either in the air or on the ground. As the game against Arsenal progressed the persons responsible for these comments were eventually silenced, as Hanson continued to give the Premier League’s team two central defenders a very uncomfortable evening in West Yorkshire. That he repeated this level of performance in the two legs against Villa only underlined to me that Hanson is more than capable of keeping his place in a City team, in the Championship. James is a Bradford lad, and I would hate the day if he ever ran out at Valley Parade not wearing Claret and Amber. He is one of us, keep him and look after him. You raised the best the better points here Wayne. As a young stiker coming into league football, the lad has gotta work his socks off to get get up to speed. It was always going to be a long learning curve, and as you pointed out, he had little mentors around at a difficult time. Im glad he`s getting the praise he deserves. This is not the time to sit back and reflect tho. This is the time to put the foot down and see where it takes us, hopefully this will be at city. Good luck with the hand. I heard he did it crushing rocks. All clubs have morons who moan at everything but for me the value of James is reflected on the visiting managers who always mention James’ contribution. I Never understand the people who want to abuse our players. We call ourselves supporters!! The clue is in the word. My girlfriend has started coming down the past couple of seasons and it still baffles her when we abuse our players. Even as a novice football watcher she knows the contribution the big fella makes to this club. And to be fair the stuff I have heard that has been aimed in his direction over the years is truly appalling. But now they know what a vital part of our team he is. Getting him signed up to another contract as he will be very hard to replace. I think James’ value is obvious – we are nowhere near as good a team when he doesn’t play. Simple. He used to work at the CO-OP! !